After you put on your green shirt and your “Top ‘o the Morning” button, check out this political cartoon, from the 19th Century. Any guesses as to the not-very-subtle message here? Maybe it will be easier to decipher if we shift the thinking forward to, say, 2011. It looks like “America” is one big happy place, with people from all over the world coming together in a diverse and prosperous stew, except for the troublemakers from one part of the world, who are loud, prone to violence, and, most significantly, refusing to assimilate. They look not quite human, really, certainly not at all like “us”. They even insist on waving their own flags. Now does it sound a bit more familiar? 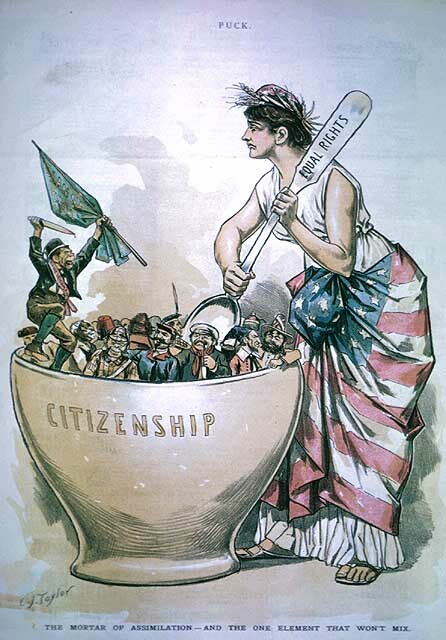 Except, of course, that, in this cartoon, the anti-American, “bad immigrants” are the Irish, not today’s most common culprits, Mexicans (and the Latinos everyone assumes must be Mexican, even if they’re from Central or South America). Yes, it’s true; at one point in our nation’s history, there were “No Irish” signs in shop windows, rampant anti-Irish employment discrimination, and widespread anti-Irish stereotypes. They were blamed for violence, bringing down wages, raising uneducated children, and other, assorted, generic anti-immigrant ills. And that’s what I’m thinking about today, as my Internet browser banner displays four-leafed clovers and people take off work to drink green beer…about integration, and what becoming “American” really means, about how immigrants shape this country as they are simultaneously shaped by it, and about how what once seemed strange and fearsome and literally foreign can now be as co-opted and thoroughly distorted as the other elements we’ve woven into this American composite. And about how THAT’S the real American way, to me, a sort of fluid and dynamic sense of “we”, rather than a strictly defined and unchanging identity to which one is forever bound…or from which one is forever excluded. I mean, who among us doesn’t love a little Cinco de Mayo celebration, granted, but many in the U.S., particularly in the context of the current (ongoing) debate over immigration reform, continue to bristle at any notion of separateness, any claim to distinct ethnic and national identity, evidenced by Mexican immigrants in the U.S., inspiring loathing and disdain in a way that seeing an Irish flag at the front of a St. Patrick’s Day parade just doesn’t. It reminds me of an incident during a debate on our instate tuition legislation in Kansas, when one of the bill’s opponents was in the middle of a particularly virulent outburst about how “these children” can’t speak English anyway, and how they are just waiting until they can go back to Mexico as rich landowners, or maybe it was something about La Reconquista (I’ve blocked some of this part out). A now-retired state legislator stood up and talked about her own Irish heritage, and about how culturally and politically acceptable it is to claim and celebrate that identity now, when it was not at one point in her family’s history. It’s just as wrong now, with today’s population of new Americans, as it was then. This entry was posted in Analysis and Commentary and tagged history, immigrant rights, social justice. Bookmark the permalink.